"I think there are two types of writers, the architects and the gardeners. The architects plan everything ahead of time, like an architect building a house. They know how many rooms are going to be in the house, what kind of roof they're going to have, where the wires are going to run, what kind of plumbing there's going to be. They have the whole thing designed and blueprinted out before they even nail the first board up." This trope concerns where the Production Team has clearly Shown Their Work in regards to the entire show, but more so than just that. If your TV show has plenty of Chekhov's Gun, Chekhov's Gunman, Chekhov's Armory, A Batman Gambit or two, Arc Words, Myth Arcs, and the Early-Bird Cameo, chances are your show is in the hands of a production team that goes above and beyond the call of duty to create a truly memorable and deeply detailed experience. Not to be confused with an actual plan or the Myth Arc itself. Other signs of the producers foreseeing everything would include introducing plot points far before they become important, possible sneak peeks of characters in the Pilot Episode, and a generally close attention to detail that you wouldn't find on just any show. This is about not only careful planning, but also anticipating and routing around troubles such as Real Life Writes the Plot and Executive Meddling. Producers and the Creative Talent behind the show are the key here. This trope does NOT concern the in-universe or in-story examples of characters planning things out to a ridiculous degree. Often overlaps with Doing It for the Art. Compare Developers' Foresight for when a creator of interactive media puts in creative edge cases for obscure scenarios, and contrast Truth in Television Indy Ploys and Writing by the Seat of Your Pants for when they have almost no idea where things may lead to, leading to The Chris Carter Effect. Has nothing to do with a Crazy-Prepared Parker Kovak. Fullmetal Alchemist: The first anime was completely different to the second specifically because the mangaka had plans for the story and wanted them to come about on their own pace, and because she didn't want Filler Arc after Filler Arc. Naoki Urasawa. The man is simply a genius at constructing insanely complex stories with little filler, where characters often appear quite a while before their importance is revealed and every question posed will be answered. RahXephon, though you will only realize this on a rewatch. Smile Pretty Cure! : In the first ending's Cure Peace variation , Cure Peace trips and face-plants. When she's next seen, her face is red afterwards. This is the only time this happens. One Piece: Though not without some continuity mistakes, it had generally done a great job introducing plot points that was hinted years in advance. Examples include just about every single element, from Laboon to the Arlong Pirates' Sun Tattoo, to the one panel in chapter 18 of Buggy's flashback coming back later with great importance. All of this shows that Oda is the master of this trope and that he has earned the meme: Oda NEVER Forgets. Jun Mochizuki of Pandora Hearts fame has rightfully earned the Fan Nickname "Troll Queen" due to her entirely unexpected yet masterfully foreshadowed and supported plot twists, employing The Law of Conservation of Detail to its absolute extreme. The scene of Alice strangling Oz from the first chapter that seemed to just be there to add a touch of horror to the mood? It will make sense in seventy chapters. In the 2003 Astro Boy anime, since the main character has always had different names in Japanese and English, the first episode has him derive his name from a nearby sign that helpfully includes both "Atom" (his Japanese name) and "Astro" (his English name). Comic writer John Barber is famous for this; the man remembers everything, and has practically built his career on Arc Welding and crafting complex, gripping stories out of even the tiniest details. His run on IDW's Transformers (co-written with James Roberts, another writer known for this) is full of this, managing to take years upon years of uneven and confused writing and weave it all into a comprehensible story. Archie Comics' Mega Man adaptation was written by Ian Flynn, who had gone over the series' entire history to create impressively rich universe, introducing characters from the future games before they make a proper debut (Mega Man X makes an appearance at one point) and integrating obscure spin-offs into canon (such as Super Adventure Rockman, a poorly received FMV game released only in Japan). So it's a bummer the comic was abruptly cut short after Mega Man 3 arc, leaving lots of Early-Bird Cameo left hanging. Unfriended features a video of a girl's suicide posted on YouTube as the kickstart to the plot. Typing in the video's URL into a real web browser takes the user to a "this video has been removed" screen, citing real life abuse and crime. How to Train Your Dragon: It's incredibly hard to notice (who ever first discovered this must have eagle eyes) but Toothless has scars from the thing Hiccup used to shoot him down. Hiccup also has a slight scar on his chin, but how he got it was not known until the second film. It's revealed that he got it when he was accidentally scratched by Cloudjumper as a baby, and it's also how Valka is able to recognize him after twenty years. More here. Star Wars: Revenge of the Sith contains one scene that was filmed during the prior movie Attack of the Clones, that of Owen and Beru receiving Luke from Obi-Wan. It would have been too expensive to get the actors and crew back out to the Tunisian desert for just one scene, and it was something they knew they needed to set up the original trilogy. Catch-22 is one of the best examples of this. The book doesn't follow a linear progression of time. Instead, the narration jumps forward and backward constantly, which can be very confusing to the reader, especially since there is not even a single date mentioned. Ever. The only way to tell when an event described happened is by how many missions the protagonist had flown at the time. Despite the convoluted narration format and the fact that the book features over 20 important characters, there isn't a single Plot Hole in the story. 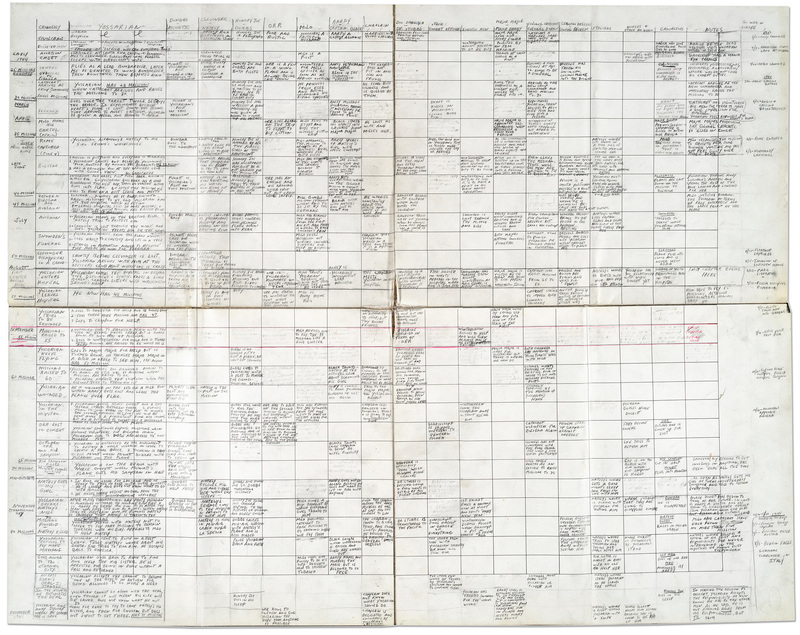 Joseph Heller, the book's writer, famously kept a detailed graph ◊ to keep track of the timeline and each character's actions while writing the book, which he started in 1953; it was first published in 1961. Harry Potter quickly gained a reputation for this, with its fans obsessively poring over every minor character or object introduced trying to find out what importance they had. When presented with the mystery of who stole one of Voldemort's Horcruxes and left a note with the initials RAB, many fans dismissed a character with those initials who had been mentioned all of twice in books one through six as "too obvious". Said character was indeed RAB. In Order of the Phoenix, Rowling gave the kid that Dudley was bullying the last name "Evans", which is the maiden name of Lily Potter and Petunia Dursley. She had no intentions to make him a secret relative of Harry's, but don't tell that to the fanbase, who went crazy with absurd rumors regarding this kid as soon as he was revealed. Warrior Cats, because the author Victoria Holmes plans out each Myth Arc before she writes it, you can find future plot twists foreshadowed many books before they appeared, throwaway lines loaded with guns of the Chekhov variety and many Chekhov's Gunmen hidden among the background characters. Just to name one example, in Sunset Brambleclaw thinks that because of the lush summer, even the normally slim Leafpool is looking quite plump. Six books later in Sunrise, it's revealed that Leafpool was pregnant in Sunset. And this is one of the minor examples. The Dresden Files is well known for its huge number of Call Backs, Chekhov's Guns, Gunmen, foreshadowings and a well plotted Myth Arc. Word of God is that the author began plotting the entire series after writing the first two chapters of Storm Front and, while allowing for new characters and some minor alterations (as a Wham Episode Changes was originally meant to be book 10 but was later pushed up to book 12), he is still following the original planning. The Cosmere has clearly been planned out decades in advance, and Brandon Sanderson rivals Eiichiro Oda in never forgetting plot points. The character of Hoid is practically an avatar of this. J. Michael Straczynski had all five seasons of Babylon 5 planned out before the show even entered production, and while some details here and there had to be changed, it still showed. He even worked out a way to replace every major character in the show before filming began. Which was good, given how many times it happened. Daniel Knauf planned six seasons in advance for Carnivàle. Unfortunately, studio interference led to a less challenging second season and cancellation soon after. Arrested Development has this in spades. It mostly crops up in foreshadowing, where innocuous jokes and unimportant details will turn out to be set-ups for much larger plot arcs further down the line. At the very least, one should keep an ear open for lines of dialogue repeated verbatim in different contexts seasons apart. Degrassi of all shows, can do this when the writers actually work really hard on a story. The biggest example of this would be Rick's storyline leading up to the shooting. The production team on QI correctly guessing which joke answers the panelists would give and setting them as the forfeit. Stephen Fry: Now, tell me about the Great Disappointment. Jo Brand: Have you been talking to my husband? Stephen: Name a poisonous snake. Stephen: What has large teeth and only one facial expression? Bill Bailey: I took a fall, but it was Worth It. In the Firefly episode "War Stories" (and later, Serenity) we learn that River was being turned into a living weapon by the Academy. We don't see her true ninja-osity until the movie, apparently. Apparently is the key word, because in "Ariel," while she is handcuffed by the Alliance guards, if one looks closely, one can see that she's quietly trying to slip out of her restraints when no one is looking. Another Joss Whedon example: The season 4 of Buffy the Vampire Slayer, "Restless", contained much foreshadowing for the seasons to come and season 3 had Faith count down the days leading to Buffy's death two years before it happened. Joss also arranged for every season finale of the show to provide some kind of closure, just in case the show wasn't renewed. Willow's famous line "I think I'm kind of gay" from Season 3 is actually not an example - as Willow entering a lesbian relationship became a Throw It In! during Season 4 and the other line was just a fun coincidence. The idea of the Dominion was introduced in a Ferengi episode (DS9 for 'joke episode'). The Dominion turn out to be the main villain after the next season until the end of the show. In the extras, the producers even say they did this intentionally. Damar was introduced in Season 4 as one of Dukat's officers who had barely more lines than an extra, which, according to the DS9 Companion, confused actor Casey Biggs until the producers reassured him that they had "big plans" for his character. It took an entire season and a half more before he even rose to the level of "supporting character," but he ended up being crucial to the overarching plotlines of the last two seasons. The creators of How I Met Your Mother plan their use of flashbacks ahead of time. During the second season (filmed in 2006), they revealed that they'd shot some footage to be used as a flashback for the series finale. As of season 7's ending, the creators also revealed they had been planning on Barney and Robin eventually getting married since the episode where they break up in season 5, THREE years ago. Everything we see of Barney and Robin in the following episodes/seasons (5-8) is getting them back around to the point of dating again and eventually marrying. Basically, they are the definition of "endgame". The creators have also revealed, as of S8, that they planned for Ted and the Mother to meet at a train station since very early in the series. The opening credits of Game of Thrones. Not only are there stunning Clock Punk castles rising up from a map, breathtaking music and the backstory told by metaphor, but the areas given detail change per episode in accordance with what areas are the main focus of the episode. Not only this but also they've put the house sigils in front of the actor's name, respective to their character. In one of the most interesting cases, the musical cue for the Silence briefly plays during Amy's introduction in "The Eleventh Hour", a season before they become a threat. In a mid-Series 2 episode, a briefly seen newspaper has a reference to the final enemy of Series 3. As the main description on HBO's The Wire, "all the pieces matter" accurately explains David Simon's plotting of the series well in advance. Multiple plot points are set up a season (or multiple seasons) in advance, and are foreshadowed so subtly that it requires a second viewing to catch all the instances. Barksdale soldier Bodie's death is telegraphed right from the third episode of the series. A key witness in Clay Davis' trial in the final season is a chauffeur who was (initially thought of as) a bit character in a first-season episode. Omar's death is foreshadowed more than two seasons before it actually happens via the character of Kenard. Derren Brown is quite the chessmaster. The Experiments episode The Guilt Trip shows how far he'd go to pull off his con by even building a fake police station in the nearby village just in case the mark decides to hightail there alone to confess to a murder he was framed for, when the original plan was to have the mark confess on site. The second episode makes an offhand reference to Emma staying in Tallahasse for a while - a full season before it's revealed that Emma lived there with Henry's father. David Anders signed on after being told his character was really Dr. Frankenstein, which wasn't revealed until early Season 2. Meghan Ory was likewise told that Red would turn out to be the wolf long before it actually happened on the show. Maid Marian appears briefly in Robin Hood's debut episode in Season 2 only from far away. She doesn't appear again until a surprise twist in the Season 3 finale. She's played by the same actress, meaning eagle-eyed viewers could have guessed the twist simply by re-watching the episode "Lacey". In Modern Family, where each season corresponds to an actual year in the lives of the three families, the characters have actual birthdays that are celebrated at the same time every season. From the very beginning of the Professor Layton series, the title professor always wears the same hat, refuses to take it off, and will go to ridiculous lengths to do so. The reason for this is revealed in the ending of the third game. The first Inazuma Eleven game introduces a finishing technique named "Emperor Penguin No. 2" halfway through the game, which is likely to leave the player wondering if there's a "No. 1" anywhere. What Emperor Penguin No. 1 is, and even the reason why nobody dared so much as mention it previously, is finally revealed halfway through the second game. In another case similar to Professor Layton's hat, from Kidou's first appearance in the very first chapter of the first Inazuma Eleven game, he is always wearing a pair of blue-rimmed goggles, except he is consistently shown without them in flashbacks to his childhood. The reason for this is explained in the third game. A teaser trailer for Team Fortress 2's Engineer Update showed in the background robotic Heavy and Demoman heads. Robots wouldn't be added to the game until the Mann vs Machine update over two years later. This wasn't the only hint they dropped either . 8-Bit Theater is a Ten Year Long Brick Joke. Era Of Errors has a storyline that's been in production for EIGHT YEARS before the webcomic even started, with the author having thousands of pages of storyline/notes/character sheets/backstory written, including most of the entire series storyline. The story kicks off in 2002 with a strange image appearing out of nowhere . It still hasn't been resolved, but hints have been dropped to the Myth Arc from time to time, with a big one involving the figure in the image being revealed in 2015 . Fans noticed that Zeetha's backstory lines up oddly well with Bangladesh Dupree's. It pays off 14 years later, when Bang finds out and makes the connection. Zeetha's heritage has been hinted at almost as long. While fans have long figured it out (she's Baron Wulfenbach's daughter and Gil's twin sister), it still hasn't been directly addressed in the story. The Order of the Stick is all over this trope, and is one of the causes for the frequent delays. The early gag-a-strip episodes had the party cleric turning undead for one strip, which was going to be followed by Durkon being transformed into an undead vampire to the confusion of the party as they revist the "Durkon turns undead" joke. The Shadow Of Greed might qualify. Ask Ironeye about it. In DasBoSchitt's Giant Man Is Not Afraid , at 0:21 a visible link to a YouTube video is shown, which, if typed in, will send you to the same YouTube video the Heavy is watching later in the video. Avatar: The Last Airbender is an example of this. Sure, some episodes were more filler than others but the creators had the whole series planned out before hand. For example, in "The Northern Air Temple" characters meet an eccentric mechanist. His workshop is scattered with blue-prints and other minor details- one of which are plans for a giant drill which doesn't show up until a season later. Throughout the series, there are pictures, references and statues of the mythical Lion Turtle, even so far back as the original Pilot Episode. This becomes rather important when the Lion Turtle appears in the finale. There's even a video interview with the makers online that talks about how once the ball got rolling, they ended up creating the entire plot rapidly, and when they made their proposal to the Nick execs, it lasted several hours, compared to most show's several minutes. They were granted funding for a test pilot after being told by the execs they had made more than enough of a case. In The Legend of Korra, it came as a rather big shock to most fans when it was revealed the Equalists would be using Mini-Mecha to fight. Most fans, but not all- because a few keen eyes noticed that for a few seconds in the first episode, you could see low quality blueprints. What's more impressive; that the creators bothered to put such a small detail in, or that the fanbase managed to catch it? A far more brilliant example than the previous example occurs in The Legend of Korra, and it spans the entire franchise. In the ATLA finale, the Lion Turtles and energybending were established as ancient animals and bending arts, respectively, were shown in the present day. With the two-part "Beginnings", episodes that came five years after the ATLA finale, The Legend of Korra reveals the former details to be absolutely true. Not only that, but the origin of humans being able to use the elements is also revealed; just as the Lion Turtle was able to give Aang an ability, so too were the ancient Lion Turtles, who gave the different elements to humanity! If that weren't enough, the creators realized that the sources of bending were already elaborated upon in ATLA, and to reconcile the sources of bending and the ability to bend, they have Wan doing the Dancing Dragon alongside a dragon, the source that taught how to firebend as established in the previous series. Finally, the idea of the Avatar being connected to both the human world and the spirit world makes a lot more sense with the revelation that the Avatar is the combination of a human and Raava. The Avatar cycle is the way it is because that is the order in which Wan learned the elements. Truly, these episodes were crafted by people who truly love and care for the franchise. Bojack Horseman similar to the Futurama example below, has a lot of small details in dialogue and backgrounds that foreshadow character actions later. In the first episode, there's a throwaway line that Bojack let Todd stay at his mansion because he thought he was a troubled gay teen. When flashbacks reveal that Herb left Horsin' Around because he was outed as gay and was fired, it becomes obvious that Bojack let Todd of all people stay because of guilt. Episode four has a background gag where a man orders a steak, which is then served by an anthro cow. We wouldn't learn where genuine animal meat comes from until much later in season two. Futurama first appeared to be a pretty entertaining animated show where nothing ever changes, with the only long-term story arc focusing on the fairly mundane possibility of Fry and Leela hooking up. Cut to where we find out how Fry ended up getting frozen (we can even see the perpetrator's SHADOW in the pilot episode), Bender being buried in the desert, the crew being the crash-landed ship in Roswell, finding out why Fry is the way is he is, and others. This show was surprisingly well laid-out from the beginning, not a lot felt like it was made up as they went along. Gravity Falls foreshadows a lot of events early on. There's the overt, like Grunkle Stan retreating into a secret base at the end of the first episode implying that he feigns ignorance about the town's weirdness. But there are also the subtle, such as various background elements having the Eye of Providence hinting at the constant presence of the Big Bad, Bill Cipher, Grunkle Stan's "STNLYMBL" license plate hinting at his true identity, and a multitude of repetitive imagery (Why is Grunkle Stan shown as being on fire or dead so many times...?) That is to say nothing of opening sequence itself, which also includes hints to future plot points, like the Zodiac Ten or the effects that the multidimensional portal has on gravity. Infinity Train creator Owen Dennis has claim to have planned out how the series will end, as well as every single train car Tulip will pass through. Steven Universe was clearly planned out very far in advance—according to interviews, a one-month preproduction writing sessions covered numerous story elements that took five years of broadcast to reveal. Rewatch the first season with knowledge of what's to come and you'll discover a truly shocking amount of Foreshadowing and Chekhov's Guns. One of the most notable example of this comes in the form of an entire character: the Conspiracy Theorist Ronaldo, who not only has many of his theories proven correct as the series goes on, but also has some of his more innocuous lines serve as foreshadowing. For example, a season one episode ends with a rant that summarized the yet-to-be-explained Backstory and Myth Arc, with some information in said rambling (such as the identity of the main villains) not even being mentioned until the end of the following season. The sheer level of detail that the creators manage to squeeze into every episode is pretty amazing, especially given that said episodes are usually only 11 minutes long.